Sammeln Sie mit dem Kauf dieses Artikels Sie bis zu 313 Treuepunkte. Ihr Warenkorb hat insgesamt 313 Punkte die in einen Gutschein im Wert von umgerechnet werden können 31,30€. K-SPORT is over 20 million US dollars and we employ over 180 people and our corporate complex is comprised of 30,000 square meters. That is the reason we can offer perfect quality and perfect performance products to our sole distributors and dealers in the world due to our excellent group of employees. K-SPORT shock absorbers and 2/4/6/8/12 POT brake system kits are made in Taiwan with owns stable market and the annual sales volumes are exceed 10 million US dollars in the world. These shock absorbers and brake system kits can be found on many winning race teams in Southeast Asia such as most famous "MACAU GRAND PRIX", “ASIA PACIFIC RALLY CHAMPIONSHIP", "TIME ATTACK", and "EUROPEAN DRIFT CHAMPIONSHIP" In order to maintain the high quality of K-SPORT , we test each and every product by our instrument and professional racing car in practice. 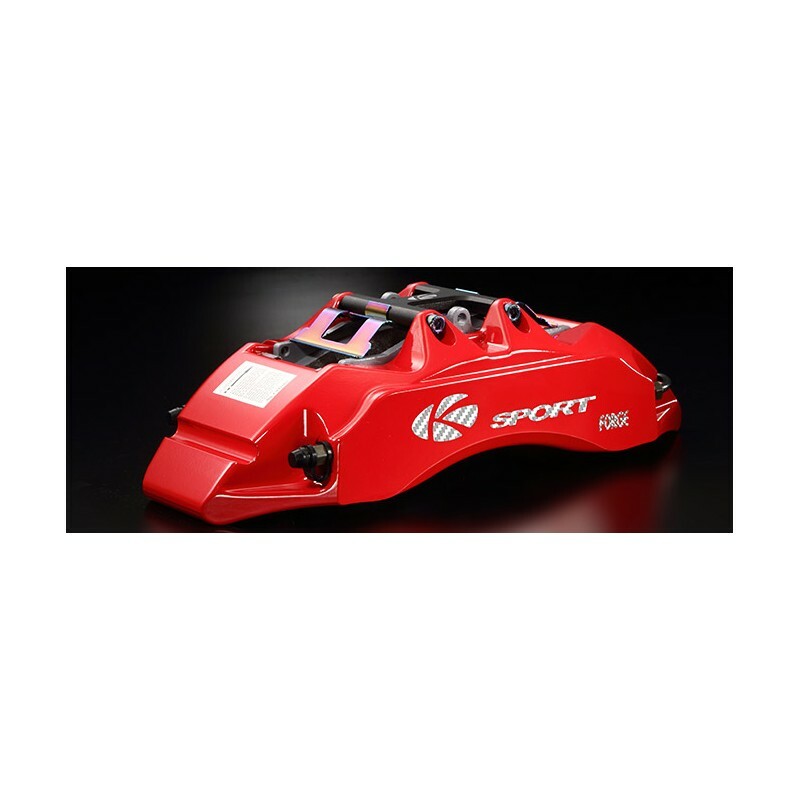 K-SPORT series products can be found in many countries, such as USA, England, Japan, and in other 50 countries around the world. We are the qualified manufacturer that is approved by TUV/ ISO 9001:2015, TUV Osterreich, in EU and FIA as well as obtained the testing report from WORLD "ARTC" (Automotive Research TestingCenter). Are perforated brakes more expensive than slotted discs? Perforated and slotted discs make no difference in price. Do perforated / slotted brakes dissipate heat better? Whether perforated or slotted - the additional channels have hardly any influence on heat dissipation. 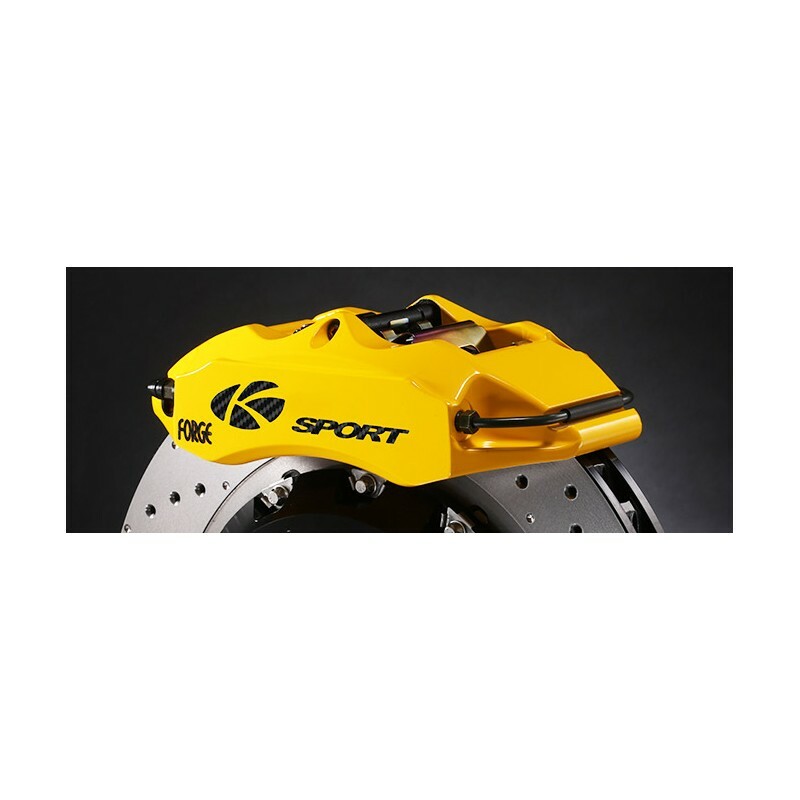 The brake disc ventilation and cooling takes place through the cooling air ducts inside the K-Sport brake disc. Do perforated / slotted discs have more grip? 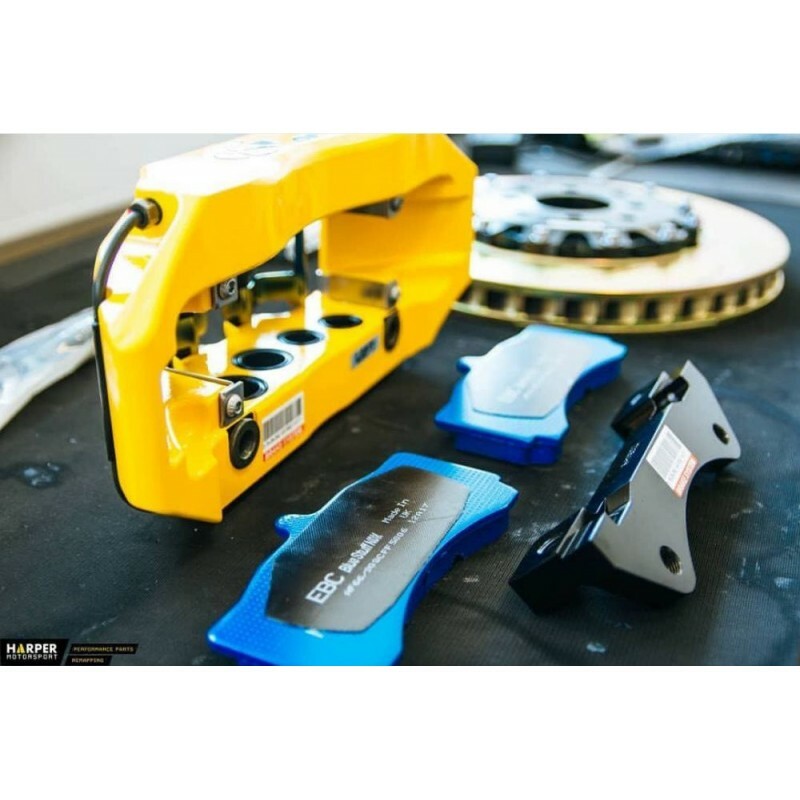 Due to the more open surface, perforated and slotted brakes increase the friction coefficient of the disc. This allows a faster reaction when the brake is actuated. Especially in wet conditions, the wet film can be broken through more quickly. The evaporating water is also removed more quickly. Thus no water vapour cushion can form between brake lining and brake disc, which would delay the brake force development. What are the slots / holes for? The slots or holes in the friction rings serve exclusively to clean the linings. Gases and particles produced during braking are discharged through the recesses or holes. 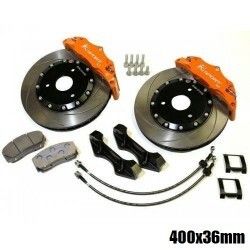 This ensures better contact between the brake lining and disc. Do perforated / slotted brakes produce more noise? Due to the fine edges on the holes and slots, sports brake discs have a higher coefficient of friction. 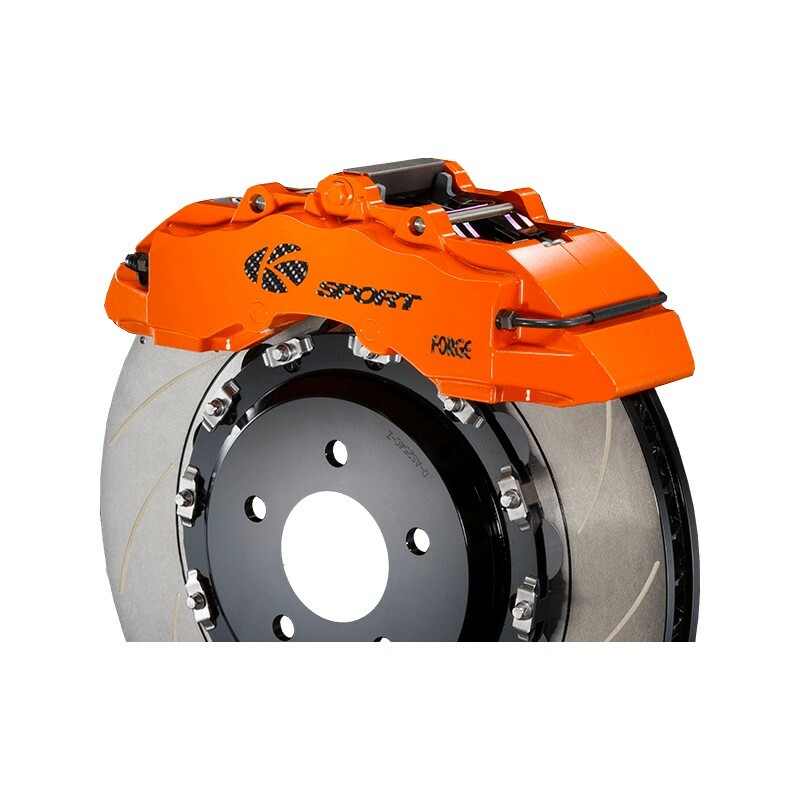 Therefore sports brakes are often louder than normal brake discs. Perforated discs also usually run somewhat quieter than slotted brake discs. Due to the slotted channels, which run across the entire width of the disc, any noise is more strongly directed to the outside. However, this is very rarely perceived as disturbing. What should I bear in mind when choosing perforated brake discs? Due to the perforated discs, perforated brake discs have a greater tendency to crack. Under high loads, fine cracks may form from the bores. If cracks are visible, the friction rings should be replaced. Does the brake booster have to be changed when installing a K-Sport brake? No, the original brake booster can still be used. Our brake calipers are designed so that the total piston area corresponds approximately to that of the standard caliper. This ensures that the ratio of master cylinder to brake calliper or brake piston surface is maintained. Can I only install a larger brake at the front? Yes, it is not a problem to install a larger brake only on the front axle, as 70 - 80 percent of the total braking power is usually handled by the front brake system. The standard rear axle brake system is therefore sufficient. 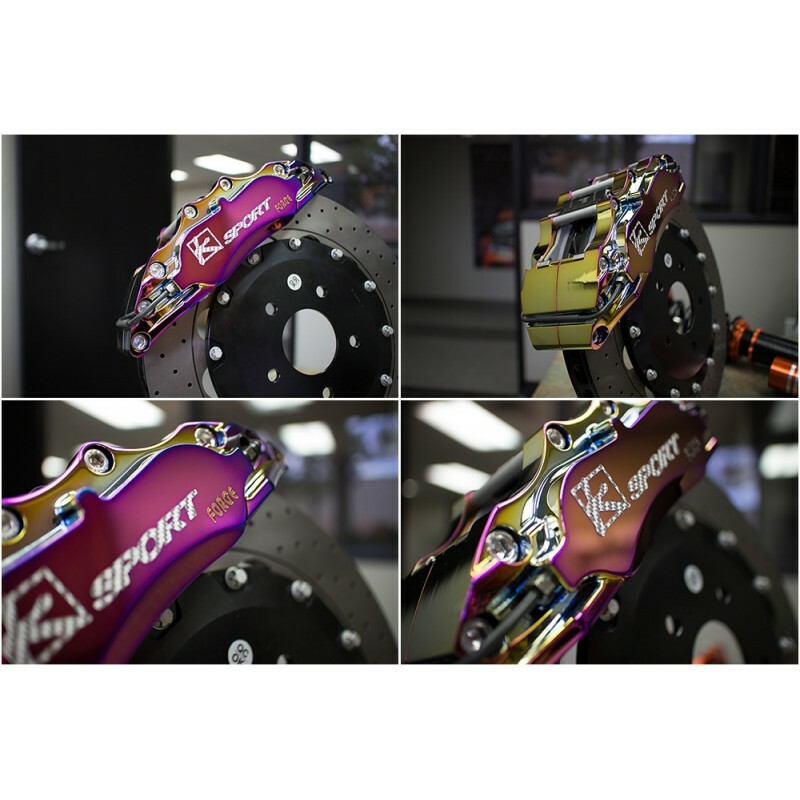 If the rear brake system is changed, the front brake system must normally also be adapted. Which brake fluid must I use in my K-Sport brake system? 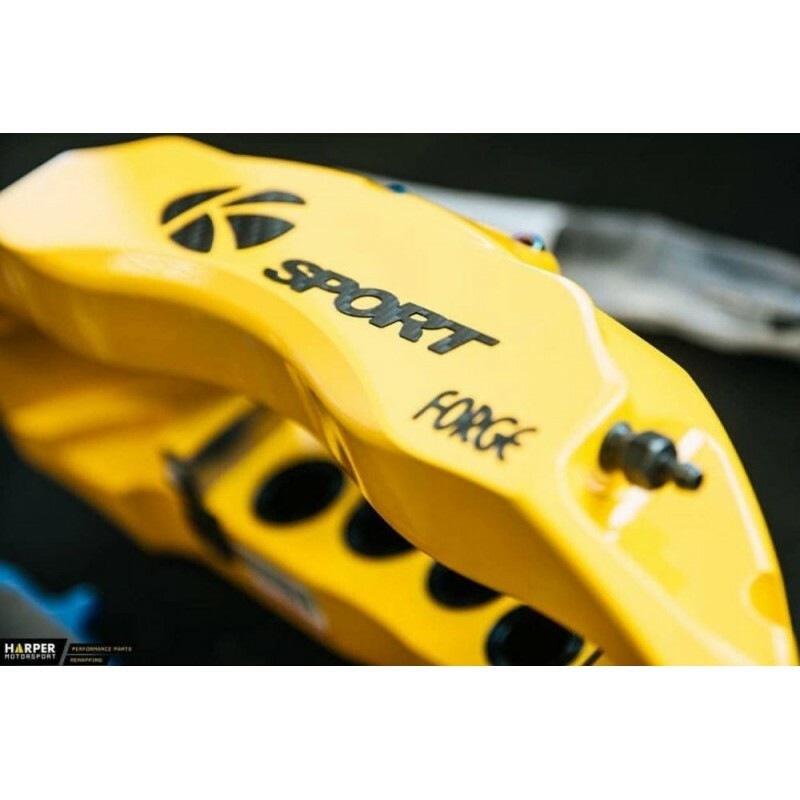 Basically, you can drive any brake fluid in the new K-Sport brake system without hesitation. It tolerates DOT3, DOT4, DOT5, etc. BUT: The limiting factor is always the vehicle. Therefore, always use the brake fluid prescribed for your vehicle by the manufacturer. To be able to drive our 286x26mm sports brake system you usually need at least 15 inch rims. To be able to drive our 304x28mm sports brake system you usually need at least 16 inch rims. To be able to drive our 330x32mm sports brake system you usually need at least 17 inch rims. To be able to drive our 356x32mm sports brake system you usually need at least 18 inch rims. To be able to drive our 380x32mm sports brake system you usually need at least 19 inch rims. To be able to drive our 400x36mm sports brake system you usually need at least 20 inch rims. Depending on the rim design and model, the spokes are shaped very differently towards the inside (in the direction of the brake calliper). The distance between the brake calliper and the rim should be at least 2mm. If there is less than 2mm clearance, you can use thin track plates. The observance of the minimum distance is TÜV-relevant. In order to check the freedom of movement with your rims, we can send you a brake cross-section as a PDF file by email. You can print it out, cut it out and hold it in your rim. If you are interested, please contact our customer service by e-mail or telephone. 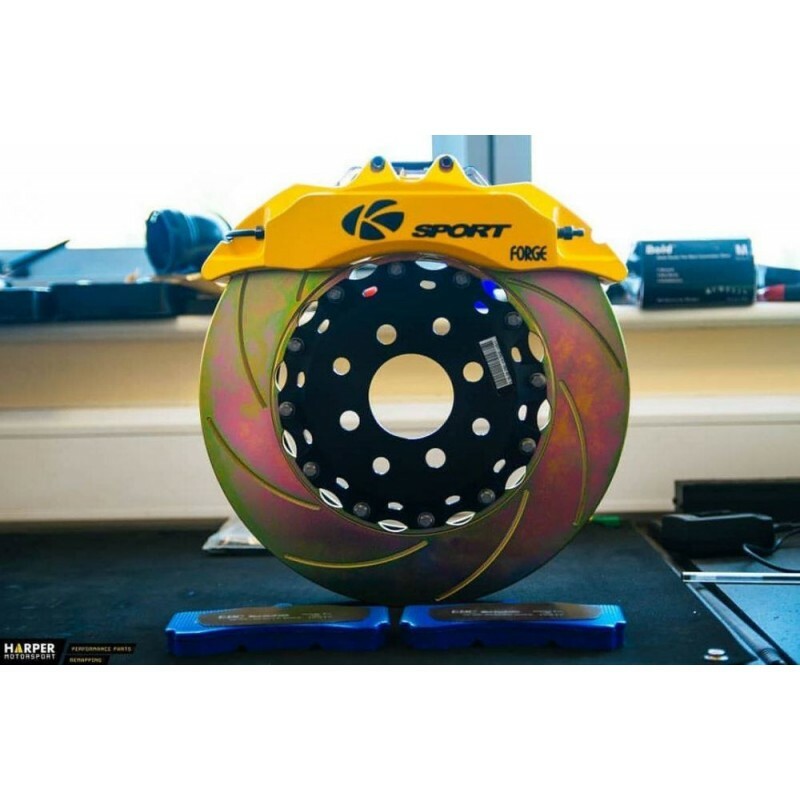 What are K-Sport brake discs made of? 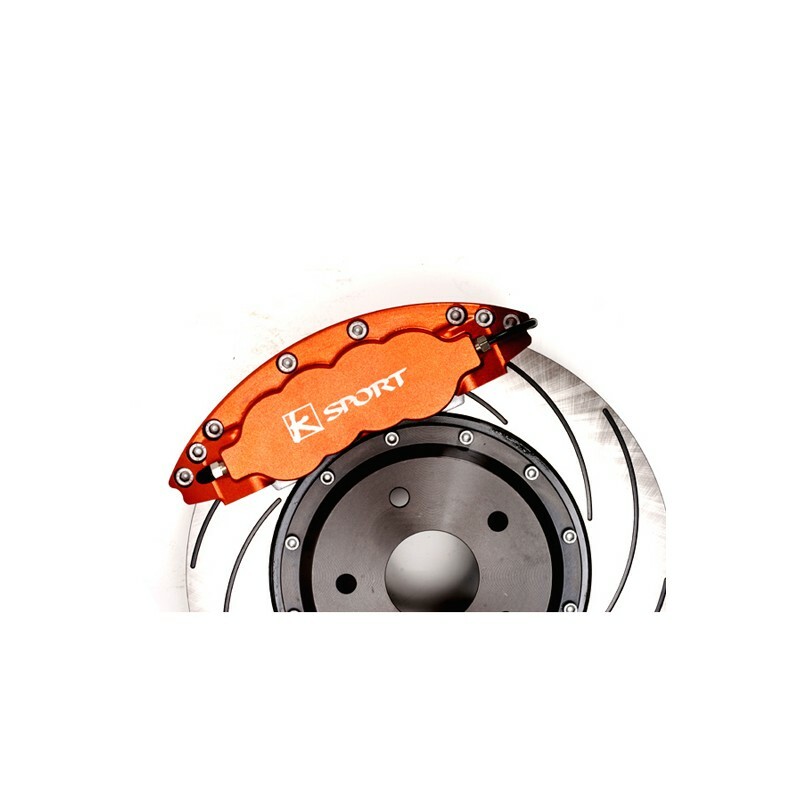 Our K-Sport brake discs are designed in two parts. The cast steel friction ring is bolted to a CNC-milled brake disc cup. This is made of high-strength Al 6061 aircraft aluminium and surface-finished with a hardcoat layer for corrosion protection. An advantage of this construction method is the low weight. By using lightweight materials at this point, the unsuspended, rotating masses can be kept as low as possible, which benefits the overall handling of the vehicle. What are floating mounted brake discs? In addition to the classic bolted brake discs, there are so-called "floating mounted brake discs". The friction ring of the brake is screwed to the brake pot so that it can move easily. Thanks to the special screw connection, the material of the friction ring can expand better under higher loads and heat. This prevents tension from forming in the heated disc, which can cause an imbalance or an impact after cooling down. Floating brake discs are therefore particularly recommended for heavy-duty applications. 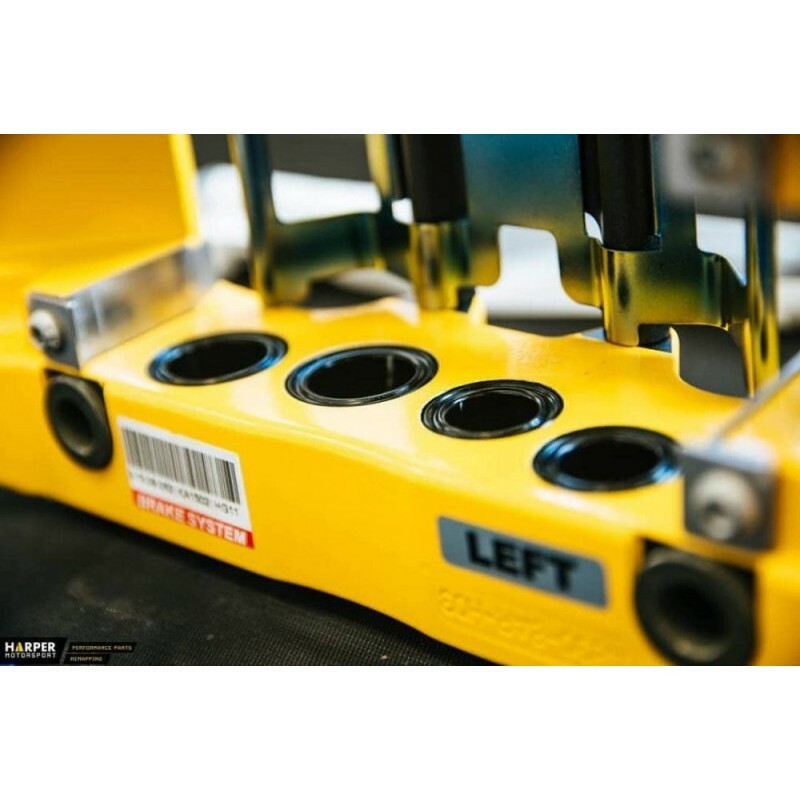 Our brake systems differ not only by the suitable bolt circle, but also by the pot depth and the brake caliper holder.